This season they’ve been a solid part of the second league, but in 2016/17 it might prove more difficult to compete. While supporters will surely provide SpVgg Greuther Fürth with home advantage, the team are facing relocation from their historical main grandstand. Earlier this year the structure, oldest throughout the league at 65 years, was demolished. With it down went the changing rooms, media section and club facilities. Up to 40 containers have been set up behind the construction site to assure constant use of the stadium, but it may take a while for both local and visiting teams to adjust. After one season bulk part of the new stand should be complete, finally providing the club with amenities meeting both domestic and international standards. The €17 million project will provide Greuther Fürth with 2,670 seats under cover, including new media and hospitality areas. It’s not the first part of Sportpark Ronhof that we’ve shown you grow. 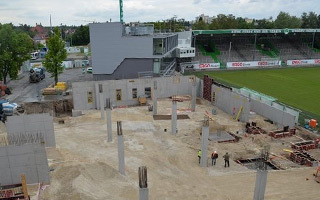 Back in 2012 the club erected a new south-west stand and now, courtesy of Greuther Fürth, you may see the new structure rise from the ground. After just over a month’s work the future stand’s outline can clearly be seen.